A fresh coat of paint on your house’s exterior does a whole lot more than to simply spruce the place up. In fact, paint is often the last line of defense against expensive rot and damage that can occur as a result of harsh weather conditions and even pests. Homes left unpainted or those with inadequate or peeling paint jobs can suffer a shocking amount of wood damage in a fairly short time that can cost thousands of dollars to repair. It can even pave the way for the growth of mold and mildew that can affect both your homes’ value and the health of your family. Clearly, there is more to paint than simple aesthetics- The practical importance of a well-done exterior paint job cannot be ignored. Classy Green Exterior Painters has been in the business of painting houses for over 7 years now and our sterling reputation for quality work and exemplary customer service is the bedrock on which our business stands. Our dedication to customer satisfaction and attention to the fine detail of our work aren’t all that sets us apart from our competitors, however. When you hire us to do a job, you can be assured that you won’t have to deal with the many complications that can come with hiring fly-by-night painting contractors because we don’t work with subcontractors or piecemeal workers. All of the work that is performed by our outfit is carried out only by trained, well-vetted payroll employees of Classy Green Dubai Painters and nobody else. Classy Green Dubai Painters is a company that believes that the right tools are required for the right job if things are going to get done properly. 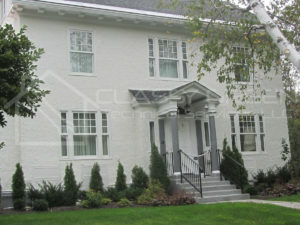 Our painters are always equipped with everything they need to perform a thorough, professional exterior painting job. There’s no job too big or too small for our team! Whether it’s painting heritage buildings, repairing and painting stucco, or simply touching up your trim, we’d love to help you get the best work for the most reasonable prices around. It’s more than these practical concerns that have allowed us to retain our customers for over 7 years- we also pay extra attention to the needs and concerns of our clients. This dedication to customer service is what truly sets us apart from the pack. Our team will work closely with you to ensure that our work is performed to exactly the standards you require. We will consult with you before work begins about your design wishes, help with color recommendations, and offer wood-working repairs that maintain the look and feel of your original design or change it, if that’s what you’d like! We take all of the appropriate precautions to protect your property, garden, and features from the mess of a big paint job by using drop-cloths, sheet plastic, and other tools to keep any mess well-contained. We also encourage you to point out any areas of special to concern to us so that we can take extra precautions to ensure their safety. Finally, we realize that a big painting job can be disruptive to your normal daily life and take great pains to be as unintrusive as possible by maintaining a clean, organized, and respectful worksite. Is Your Home Ready For A New Coat Of Paint for Exterior? If you live in the Dubai area and think that your home would benefit from a professional painting makeover, All Pro Painters is here to help. We would love nothing more than to put our proven track record of craftsmanship and service to work for you! Contact us today for your free consultation and estimate and find out why Classy Green Painters is Dubai’s most dependable name painting!